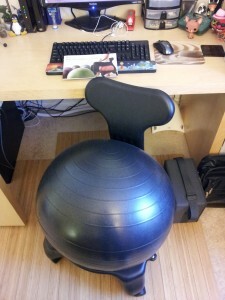 You can't swivel on a ball like you can an office chair. Forget turning to the side to get a file folder from your file cabinet, and forget using the side desk with your laptop. You'll have to get up and re-position yourself. Balls do not sit still. If you get up, expect the ball to roll. Your back will not be terribly happy with you in the morning. At least my back was really unhappy with me trying to exercise it. Over time this has subsided. You will bounce on the chair. Especially if you put on some really funky music. Men: You will need to work on keeping your junk happy. Otherwise you won't have good time. The ball is huge. You'll need to have space in order to use it. Think of a point half-way between you and the floor where you're sitting now, then extend it out to your sides. That's how big the ball will be at a minimum. You are best served building yourself up to extended periods of sitting. Trying to do an 8 hour workday will make you extremely uncomfortable. Your spouse will comment that you look like you're hatching an egg. Armed with this knowledge, I decided to pull the trigger and purchase the Gaiam Balance Ball Chair. This has several advantages including an easy-rolling coaster base and a smaller ball. It also includes a back which is supposed to be used for the included exercise book, but I have a feeling it's to keep you from completely falling backwards should you lose your balance. Smaller ball, which makes it a little easier to fit under a desk. A base which makes the ball more stable and less likely to roll away (more on this later). Coasters on the base, so you can swivel. They can also lock for the exercises. A booklet with exercises and hints on how to use the ball chair. A nice hand-pump that inflates on both the up and down strokes. The ball is more steady, so you can easily slouch and not use your core muscles. It's more expensive than just purchasing a ball separately. I still look like I'm laying an egg, but now I have a rolling nest. Overall I'm happy with this little experiment. The jury is still out on the health benefits or detriments of ball chairs, so please do your own research to see if they may be something to consider. I've found my core muscles have felt stronger, and my spine feels lengthened, but I've also noticed my lower back is not terribly happy with me in the morning (though this has subsided some). I'll post more about my Balance Ball Chair as the weeks progress. So far I'm not in any hurry to go back to my normal office chair. Not that I could anyway, as a certain cat has managed to take it over. But that's another post for another time.